Adding the silent service and rejiggering aircraft carriers could bring in new players. Free-to-play naval combat game World of Warships will make a drastic and controversial U-turn and add submarines to the mix next year, Wargaming officials announced Tuesday morning. Gamers can get a taste of the silent service October 31. 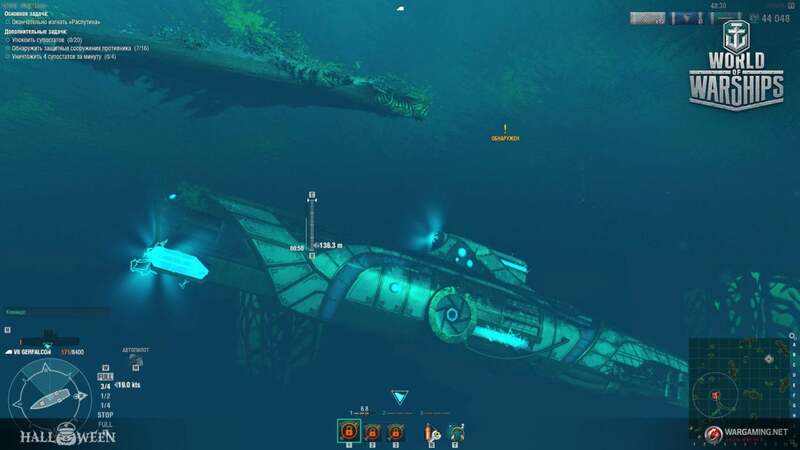 The company will let players sample submarines for the first time as part of a temporary Halloween gag, where ships and subs take on spooky themes. Submarines, however, aren't just a short-term gag. Wargaming officials said submersibles will be added as the permanent 5th class of vessels alongside World War II-era battleships, cruisers, destroyers, and aircraft carriers. World of Warships is known for its meticulously modelling of ships such as the H.M.S. Hood, Bismarck, and U.S.S. Missouri. Why this matters: This dive into the briny deep marks a drastic change for the free-to-play naval combat game, which has focused solely on surface combat since its inception three years ago. It's also a pretty big about-face, because the company has pledged multiple times never to add them to the team-based game. But Wargaming wants to broaden the appeal of World of Warships beyond naval enthusiasts and those who live to watch black-and-white Victory At Sea re-runs from a leather recliner in the den. These moves could give the player population a much-needed boost. Some basic principles of World of Warships won't change. In each match, up to 12 ships battle on an ocean map with naval gunfire, bombs, and torpedoes. To broaden interest, Wargaming has also added player-versus-environment and clan battles. The company said so far, more than 28 million people worldwide have registered to play the game on PC. Submarines can't stay underwater forever, and will have to surface as they run out of oxygen. The addition of subs, however, complicates a game that has long faced the circular problem of "balance." This is best illustrated with the children's story of a homeowner who tried to solve a mouse problem by getting a cat. To get rid of the cat, a dog is brought in, and to get rid of the dog, a lion is brought in. To get rid of the lion, an elephant is brought in. Finally, to get rid of the elephant, a mouse is brought in. For example, earlier this year, after complaints that too many battleships populated games and hid in back, Wargaming added a new destroyer with long-range stealth torpedoes that could only hit battleships. Of course, months later, to help prune back an overpopulation of destroyers sniping battleships, World of Warships added more cruisers with radar. Submarines will likely shake it up all over again by adding a third dimension underwater. Subs can dive and surface, and fire torpedoes from stealth. If you're a slow-moving battleship, having three torpedoes slam into your side can ruin your day. Even worse, radar, which effectively pruned back destroyers, won't spot submerged submarines. That's where destroyers newly equipped with depth charges will come in, the company said. Yup, there's that cat-and-mouse game. The RTS game play of aircraft carriers in World of Warships will undergo a fundamental change to help spur its popularity. Submarines won't be the only major reshuffle. The company is in the process of taking drastic actions with the ultimate naval battle machine—the aircraft carrier. Unlike battleships, cruiser, and destroyers, which are all played from a third-person perspective, aircraft carriers are controlled from a real-time strategy (RTS) map view. As in World War II, the aircraft carrier has been the most deadly of all ships, but the skill level to play it well has been rare. That's led to mostly one-sided matches, with one side salty as the Pacific Ocean and screaming profanities. 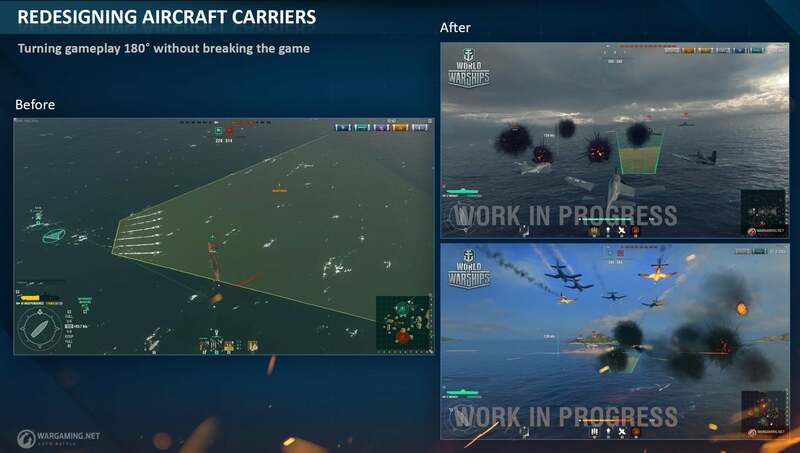 To address the skill disparity, Wargaming will change aircraft carriers from an RTS map to a third-person view, with the aircraft carrier player flying individual squadrons rather than commanding an entire air wing. Wargaming is sensitive to the feelings of players who've invested time and money in aircraft carriers, so it's preparing to offer refunds to those who have purchased premium ships, such as the famous U.S.S. Enterprise or the Imperial Japanese Navy carrier Kaga. As with the submarines, the company expects to implement aircraft carrier changes fully in 2019. 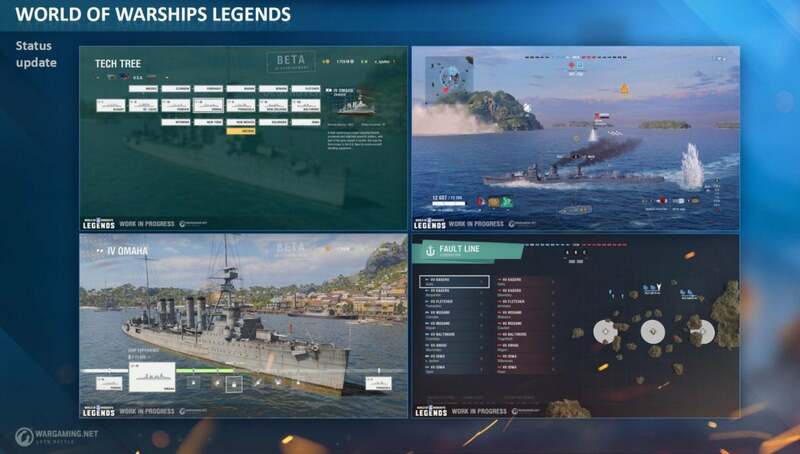 World of Warships Legends will bring the naval combat game to console next year as well. Wargaming officials denied that changes to the PC version have been made to cater to console gamers. In another drastic change for the game, some players are saying World of Warships is being dumbed down to cater to the soon-to-be-introduced World of Warships Legends for Xbox and Playstation 4 (due next year). Wargaming officials told PCWorld the worriers were wrong. Instead, North American Publishing Director of World of Warships Sasha Nikolaev said, the move is genuinely to make the game more approachable to all players, and ultimately increase the player population. 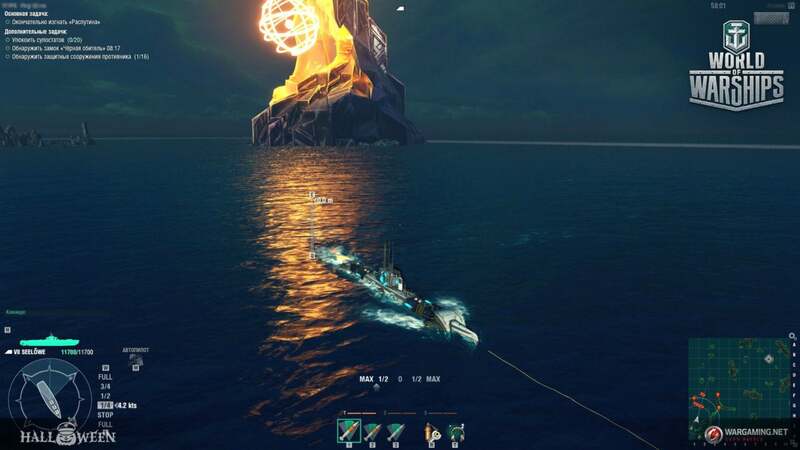 Nikolaev said the company views increasing the overall population as the best way to solve the game's issues with the matchmaking system, which often seems to pair inexperienced players against experienced players, or create teams where one side has a huge advantage in capable ships, against one side that doesn't. 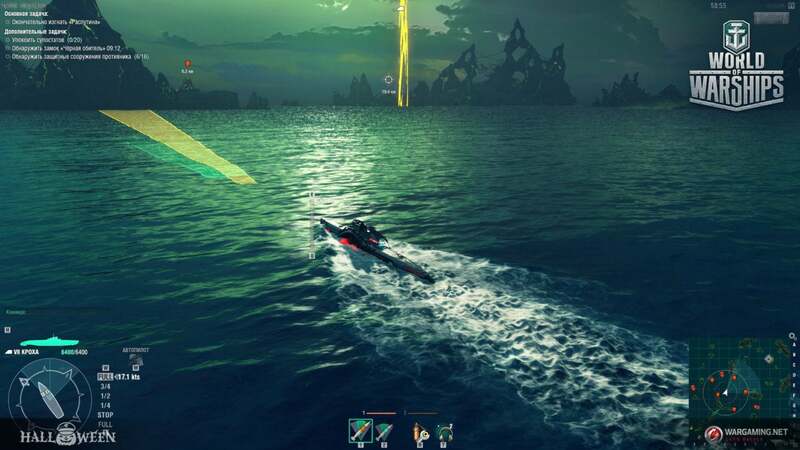 World of Warships has already added crossover play with Japanese anime show High School Fleet and steampunk-style ships in hopes of adding to the population. That, in turn, allows the matchmaking service to be more selective in face-offs, Nikolaev said. Nikolaev said the company is fully aware of the delicate balancing act of trying to keep as many players happy at once in a single world. Wargaming is planning extensive beta testing of the features. The changes also come at a tumultuous time for the company. Earlier this year, Wargaming cut more than 100 positions in its Emeryville, Calif. office and consolidated most of its operations in Austin, Texas. Submarines will be hunted by destroyers and cruisers when finally introduced next year.